Trillium Traveler: This is a test. 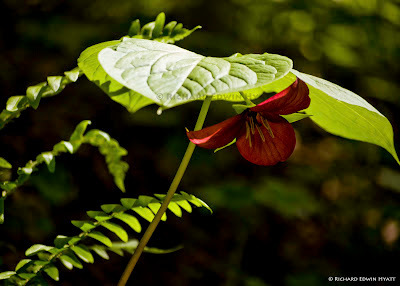 What trillium is this? Ok, I'm not a botanist. But, after some research I feel fairly confident this a Vasey's Trillium Trillium vaseyi It is commonly called a Sweet Wakerobin, Sweet Beth and/or Sweet Trillium. The flower is pedicel and nods below the whorl of three leaves. The flowers are easy to overlook because they hide below the whorl.